Before the arrival of Europeans in Africa, Mami Wata, pantheon of Western and Central African water deities, was revered in many matriarchal societies societies for her healing powers as well as her ability to lure innocent humans, particularily men. While colonialism suppressed many African religions, Mami Wata influence has not faltered, expanding to communities in the Americas and the Caribbean. She has also been gaining popularity in recent years as an image of black female power -- a phenomenon that recently reared its head via a popular interpretation of Beyoncé's "Formation" video, in which she's seen as a modern-day Mami Wata harnessing water as a force of life and destruction in post-Katrina New Orleans. But other than Bey, pop culture hasn't really given Mami her full due, that is, until DJ/multimedia artist Dyani Douze and curator Ali Rosa-Salas took it a step further with MAMI, a collective show at Brooklyn's Knockdown Center that explores the African diaspora through images of Mami Wata. "Mami Wata is considered to be a water spirit, so she has a lot of associations having to do with fertility and life, but on the flip side, she's also feared for the ways in which water can be destructive and water can hurt," Rosa-Salas said. "As women of African descent, we're always thinking about how we are not a monolith and how we exist in so many kinds of ways." The multimedia show featuring videos, performances and more from artists like Salome Asega, Nona Faustine, Doreen Garner, Aya Rodriguez-Izumi, MALAXA and Rodan Tekle. Douze and Rosa-Salas explain that the purpose of this show is to reclaim Mami Wata. After all, one of the most well known depictions of the deity comes from a widely circulated chromolithograph from the late 19th century, which was used as an advertisement for a traveling "exotic people and animal" show. And this image, used in its incredibly disturbing context, became the image that defined Mami Wata. But how does one reclaim Mami Wata? Well, it varies. 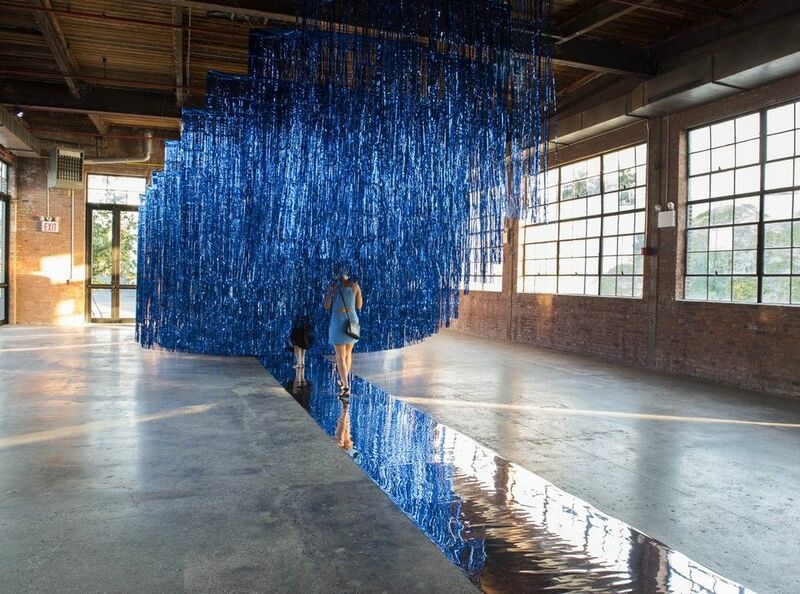 Take Aya Rodriguez-Izumi's "Offering," in which rows of blue tinsel slowly envelop the viewer as they walk down a shiny metallic runway guided by the artist herself, eventually reaching a circular room encased by tinsel and featuring furniture resembling a coral reef. Rodriguez-Izumi said the project was inspired by the concept of loss and people giving to and taking from Mami Wata. 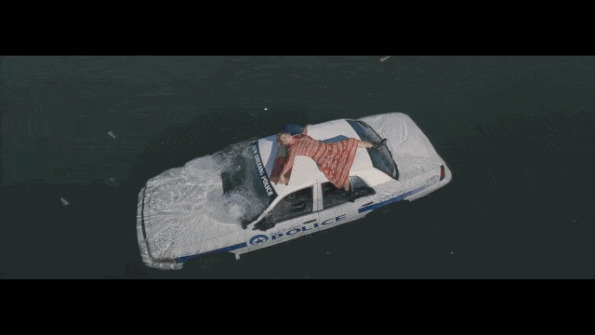 "There's this kind of movement that you do through [the piece] that's almost this swimming motion," she said explained. "Or some people have been moving through it and kind of just letting it wash over them. So I wanted this idea of drowning and to have that experience of being sort of really claustrophobic. And then you come into this center area, and there is this open space where you can now breath again." And while Rogriguez-Izumi created the piece for the exhibit, other artists like photographer Nona Faustine drew on existing projects, as her self-portrait series White Shoes focuses on the legacy of slavery in New York City. "It's not a foreign concept to bring an African deity here to New York because Africans built the city, literally built the city," Faustine said. "And so [Mami Wata] is definitely there on this coast." It's an idea that's mirrored by her displayed photo, "Even The Comfort of a Stone Would Be A Gain," which features the artist lying on rocks by the Atlantic Ocean. "She's really interested in looking at the legacy of slavery and where she fits within it, but also rewriting the history by using her own body, as well as looking at portraiture, which is an historically fraught medium in terms of exploitation and taxonomy of black and brown people's bodies," said Douze. "She's reclaiming the medium in order to insert her own subjectivity as well." Other featured work focuses not on highlighting past injustices, but on creating a more equitable future. Salome Asega and Ayodamola Okunseinde's Iyapo Repository is a museum of the future centered around the wants and needs of people of African decent. It consists of artifacts thought up by people on the street, who created inventions based on a chosen narrative, object and purpose. 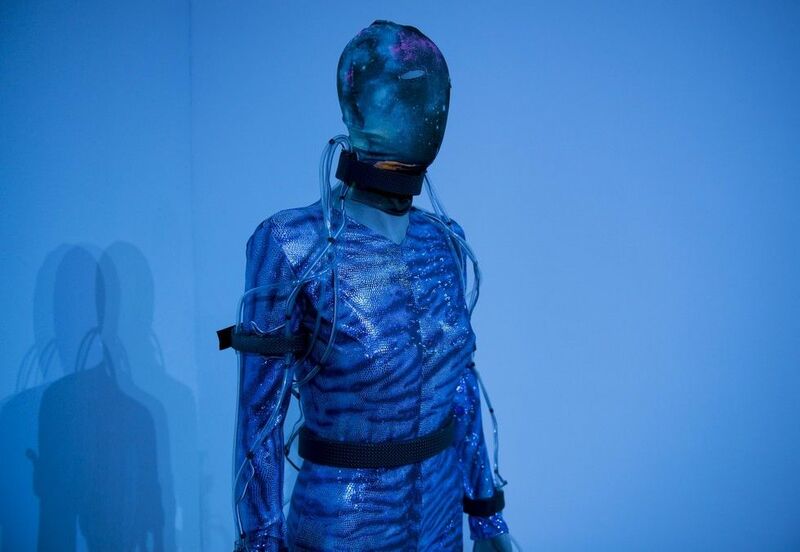 One of these artifacts displayed at MAMI is a suit with a motorized water tubing system. "In this case, this bodysuit will help somebody who had trauma with large bodies of water through the impact of the Atlantic Slave Trade. It becomes a way to deal with that cultural trauma," Okunseinde told Okayafrica. Rosa-Salas said the piece speaks to the duality of Mami Wata. It also fits in with one of the purposes of the exhibit, which is to provide a space for women of the African diaspora who have experienced trauma to mediate a relationship with water. "What inspired us was our families," she said. "Our ancestors have traumatic lineages with water. We were forcefully taken places. But also the history that's erased that I think Mami Wata represents is the life force that water is and the connections to water that aren't necessarily riddled with trauma, but are actually life affirming." And while it's a lot to take in, that's not the only thing happening within the exhibition. In addition to the permanent pieces, there will also be a series of public programs each Saturday. These include the MAMI Market, a sound and visual performance collaboration between Douze, Asega and the Floyd Little Double Dutch Team called P2P and a closing party hosted by Brooklyn-based DJ collective FAKE ACCENT. Rose-Salas and Douze said that it was important for them to include these other events to not only expand on the representations of Mami Wata, but also use her as a way to bring people together. "I think that at this day and age, we're just looking to understand ourselves better...," said Rose-Salas. "I think especially as women identified people of African descent, especially now, I feel our lives are under siege. Our communities are under siege. There's a necessity to build coalitions and mobilize and collectivize for safety." MAMI is on display at the Knockdown Center in Queens from August 6 to September 5.